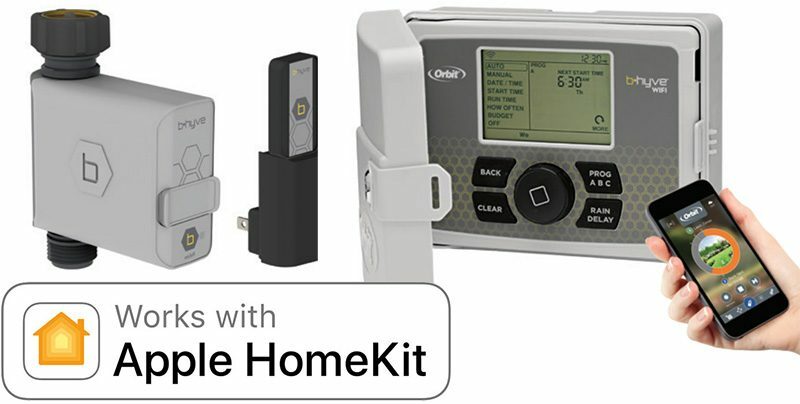 Orbit at CES 2018 this week announced that it is adding HomeKit compatibility to its new B-hyve smart hose faucet timer and a new version of its B-hyve smart sprinkler timer that will be released later this month. iPhone, iPad, and Apple Watch users will have the ability to control the lawn and garden watering systems through Apple's Home app or with Siri. HomeKit will enable users to control basic watering functions, such as turning on or off sprinklers. In the Home app, users can schedule their sprinklers to run at specific times, and find out when the next watering is. Orbit's new HomeKit-enabled B-hyve products will be available to purchase from Amazon, The Home Depot, and Lowe's in the United States. HomeKit added support for sprinkler systems and faucets in iOS 11, and the first accessories compatible with Apple's smart home platform are beginning to roll out, including Kohler's new Sensate kitchen sink faucet. Now THIS makes sense. A shower or kitchen faucet...not so much. As someone who is obsessed with having a well-watered lawn this product excites me. A nice advantage for those who also live in a drier environment where they can activate this without even being home during the hottest part of the day to keep the grass/garden area hydrated.